The continued unraveling of the Common Core makes for compelling drama — at least that's how a research project has begun presenting it. A team made up of participants from the University of Pennsylvania Graduate School of Education, the University of California in San Diego and Universidad Nacional de Educación a Distancia in Madrid, Spain have developed an interactive Web site that tells the story of the Common Core debate as it plays out over Twitter. The story has six elements, a prologue, four acts and an epilogue. The researchers built the contents around an analysis of 190,000 tweets that contained #commoncore and posted by about 53,000 "distinct actors" during a six-month period from September 2013 to February 2014. That was the same timeframe during which the debate about the Common Core State Standards entered the mainstream and became, as the researchers put it, a "campaign issue for politicians from both parties." Twitter was chosen as the medium to be researched because it represents a social media site that allows for "political participation, free flow of information and broader democratic mobilization," the researchers explained in their prologue. It's also becoming a tool for redefining how education policy is "shaped, understood and implemented," they noted in a statement. 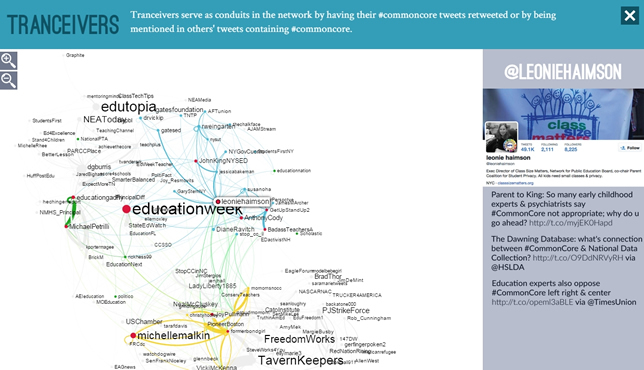 Act 1 of the site lays out details of the dataset used by the researchers, examines the "commoncore" network formed on Twitter, points to three distinct "communities" that formed out of the network and introduces two types of twitter actors of greatest interest in the research. The communities include one that generally supports the Common Core; another consisting of educators who oppose it; and a third made up of people outside of education who oppose it based on the idea that it's related to larger social issues they care about. The actors consist of "transmitters," those who send out a "large number" of tweets, and "transceivers," those who act as conduits in the conversation because they receive a lot of commoncore tweets and are mentioned often or retweeted often by others. The research also identified a third group — the "transcenders," 41 individuals or organizations that sent the highest number of commoncore tweets and were retweeted or mentioned the most often. The site includes a link to each of those networks that allows the viewer to explore the specific actors and representative tweets from them and see how they connect to each other. 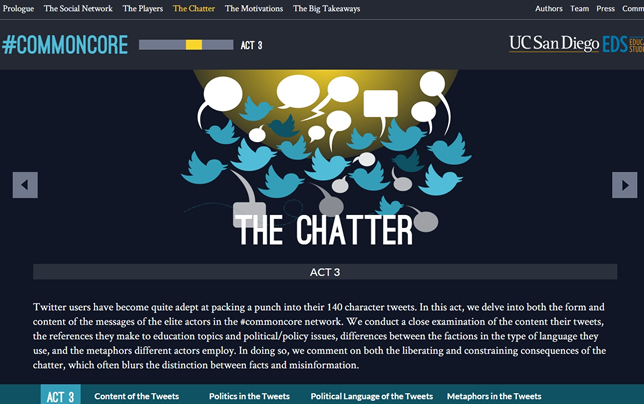 Act 3 explores the "chatter," the content and form of the messages. Act 4 examines the motivations of the different actors to participate in the commoncore debate. It also includes short audio interviews with some of the participants, who explain their interests and motivations. The epilogue offers interpretations by the researchers and provides some lessons. A major lesson is that the Common Core has become "a proxy war about broader cultural disagreements over the future direction of American education." Few of the reasons for opposition to it have to do with the standards, the authors stated; they're related to other education issues, including opposition to federal participation in education; a widespread belief that the Common Core is actually a "gateway for access to data on children" that will be used for exploitive purposes; a way for corporations to exploit public education for profits; a stepladder for increasing student testing; and a belief that if the country puts its energy into standards, it'll be distracted from worrying about poverty and social inequity. The researchers also found that supporters and opponents of the Common Core tend to use different language to make their points and appeal to their specific communities. Those in favor tend to use "more policyspeak" — logical and rational arguments — and opponents preferred "politicalspeak," evoking more vivid and emotional language "to rouse peoples' passions." The researchers have begun to explore a dataset from March to November 2014, coinciding with the run-up to last year's elections. Preliminary analysis reveals that the number of actors referencing #commoncore is growing; the various networks are continuing to evolve; and "organizational and institutional actors" are playing a more important role.